"Who put the bun in the oven?" Shantelle and Wesley Dozier had been trying for nearly 11 years to conceive when they found out right before Christmas they were expecting. To break the news to Wesley's mother they decided to put a hot dog bun in the oven and wait for her to discover it. 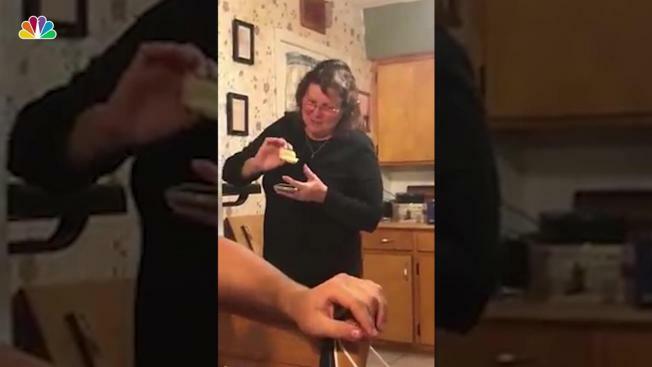 In a hilarious video filmed by the couple, the Wesley's mom, Cynthia, opens the oven to discover the rogue bun. "Who put the bun in the oven?" she asks her family. "I didn't put the bun in the oven," several members reply. Cynthia doesn't click to the joke. "Who put the hot dog bun in the oven?" she wonders out loud. That's when son Wesley pipes up: "I put a bun in the oven...just not that oven." It takes a while but finally Cynthia gets it, at which point she bursts into tears, hugging her son and his partner.